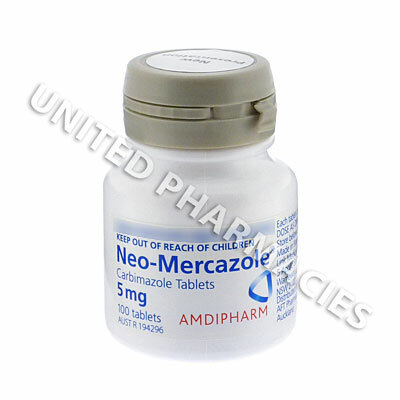 Neo-Mercazole (Carbimazole) is prescribed to treat hyperthyroidism in patients with an overactive thyroid gland. It works by preventing the release of excess hormones from the thyroid to prevent symptoms such as elevated heart rate, weight loss, thinning of the skin, or tremors. 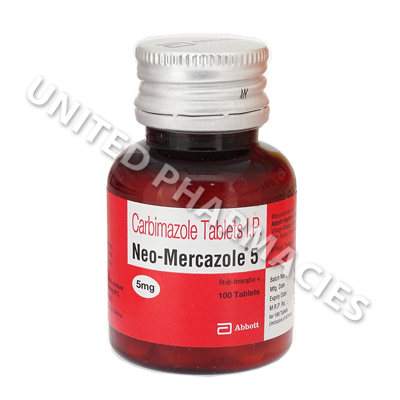 Neo-Mercazole (Carbimazole) is prescribed to treat hyperthyroidism in patients with an overactive thyroid gland. It works by preventing the release of excess hormones from the thyroid to prevent symptoms such as elevated heart rate, weight loss, thinning of the skin, or tremors. Your doctor may also prescribe it to treat other conditions or for other unlisted reasons. Follow your doctor`s instructions for using Neo-Mercazole (Carbimazole) to get the best results from the medication. Your individual dosage and frequency of administration will be determined based on your symptom severity, health condition, and response to previous treatments. Do not self-medicate as misuse could cause severe health complications. Immediately tell your doctor about any unusual symptoms you experience to allow enough time to take the correct response. These can require reduced doses or frequency of administration to prevent further health problems from occurring. Neo-Mercazole (Carbimazole) might cause depression of the bone marrow, which may trigger a reduced amount of blood cells and could also decrease the body`s ability to fight off infections. This condition could become life threatening if treatment is not obtained as soon as possible. Medical tests may be required if any symptoms of this are noticed. Liver problems may occur in certain patients as a result of taking this medicine. If you notice symptoms of this, see your doctor immediately.